From the Baldwin County Courthouse, go west on Hancock Street for 2 blocks or 0.2 mile (or the one large block containing Georgia College & State Univ.). Turn right on Clarke Street. Go one large block or 0.2 mile. Turn left onto Business Highway 441 North (Montgomery St.) and follow the signs for Business 441 N (turn right on North Columbia St.). Go approximately 7-1/2 miles on 441N. Turn left on Meriwether Rd. Go 1.0 mile. On the left (South) side of Meriwether, about 100 yards and behind the existing manufactured homes at 507 Meriwether, is the cemetery. Alternate approach: go down the dirt driveway on the left after 0.9 mile on Meriwether. Go 0.3 mile. The driveway circles to the southwest. Ask permission at the home - the cemetery is behind the home back towards Meriwether to the northeast, about 250 feet. Currently the cemetery is in the V formed by two sets of power lines. 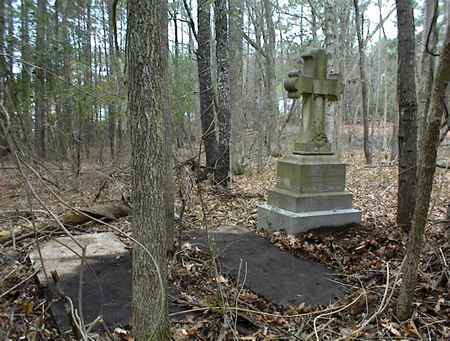 The graves are near the site of where the old Epsie Harper Gorley home stood. The graves were in a garden beside the old Harper home which has burned. w/o Robert H. Harper "Blessed are the dead who die in the Lord." 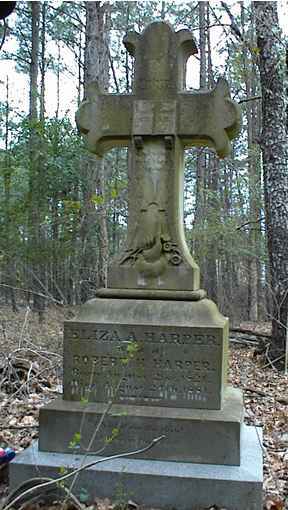 "Psalm CIII" and "Romans XII" "She loved her Bible"
Sister of W. I. Harper, per family records. TT had this as Garley, but the family name is Gorley.